Easy to use and affordable point-of-sale for small pharmacies! Star-Lite is a Windows based point-of-sale solution designed for the small pharmacy and apothecary in mind. With Star-Lite, you will experience the powerful benefits of pharmacy point-of-sale (POS) technology at a very affordable price. Count your cash, checks and other tenders at any register or workstation. With “Blind Balancing” enabled, your clerks can count their tills without having the over or short amount revealed to them. Once all drawers are counted, the Bank Deposit Report can be printed, listing all coin, paper currency, and checks – eliminating the need for an adding machine tape and separate bank deposit slip. If you can’t find it in one of our standard reports, use the Custom Report Builder to create and save your own reports. You can even export information to a comma-delimited file for use in your favorite spreadsheet! Dispensary integration allows you to view and print all prescriptions that have been filled and not yet been picked up. You can see the date and time filled as well as sold at the register. The register uses this module to check if any other prescriptions are available for pick up and notifies the clerk. 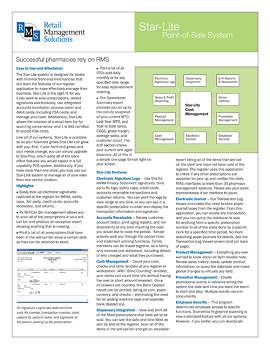 Please see our Pharmacy System Partners list for details on our integration partners. Reward your best customers by giving them gift certificates on a periodic basis (based on accumulated points), give them instant discounts at the register, or do a little of both. This program gives you the flexibility to reward your customers the way you want. Everything you ever wanted to know about an item resides here. Review sales and purchase history, including invoice numbers, update product information, review inventory levels, query the database and make global changes to virtually any field. Create promotional events in advance, telling the system the date and time you want the event to start and stop. You can have multiple events running concurrently. Easily add items from a vendor file, from a handheld unit such as a Telxon, from a laptop, or query the item file. Use this for HIPAA Privacy Statement signatures, third-party Rx logs, credit/debit & accounts receivable transactions. You can print the logs by date range at any time or you can key in a specific prescription number and display the transaction information and signature. Review customer account detail, print aging reports, and run statements at any time inputting the date you would like to close the period. Simple wizards walk you through the period close and statement printing functions.